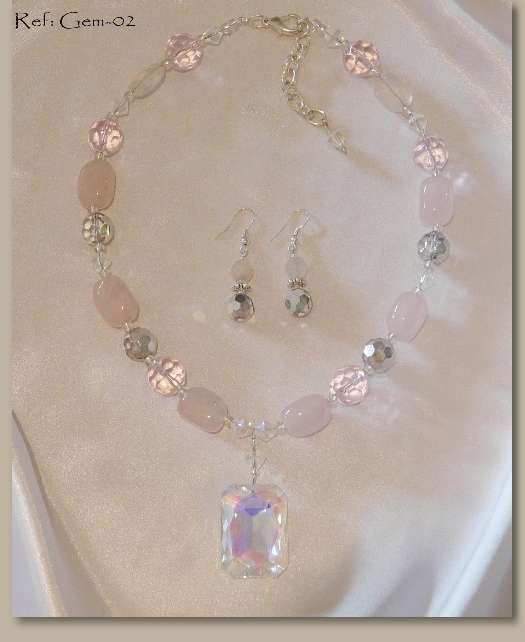 Beautiful Rose Quartz Gemstone Necklace with Crystal Pendant. This Pale Pink Semi Precious Stone Necklace is a very striking and upmarket piece of Jewelry. It makes all who wear it feel and look like a princess 😉 The Crystal Pendant is available in a beautiful sparkling heart as well and is a very popular selling item. We have matching Rose Quartz Bracelets to match, as well as Rose Quartz Earring pairs.